Vermont students’ statewide scores were competitive with those of their peers elsewhere on the computerized Smarter Balanced Assessment Consortium test, according to the most recent results, released Tuesday, Aug. 30. However, gaps among some ethnic groups and students of different economic backgrounds in Vermont continue. This year was the second administration of the online test, which is given in grades three through eight and 11 in English language arts and mathematics and is aligned to the Common Core standards. This year, more students scored proficient and above in both subjects. The standard for proficiency is considered tough, according to Education Secretary Rebecca Holcombe. 54 percent of Vermont students in grades three and four. 58 percent in fifth grade. 56 percent in sixth grade. 58 percent in seventh grade. 59 percent in eighth grade. 57 percent in 11th grade (the only year that the percentage dropped, from last year’s average of 58 percent). 56 percent of Vermont students in third grade. 50 percent in fourth grade. 43 percent in fifth grade. 41 percent in sixth grade. 46 percent in seventh grade. 44 percent in eighth grade. 38 percent in 11th grade (a 1 percentage point increase over the previous year). Among the subgroups, more students of Asian descent scored at proficient and above than the state average across subjects and grades, while blacks and American Indians (including Alaskan Natives) scored below the state average for proficiency across subjects and grades. Notably, Vermont Hispanic students scored better than the state average for proficiency and above in English in grades six (60 percent to 56 percent) and eight (68 percent to 59 percent). In math they didn’t do as well, falling below the state average for proficiency in all grades except eighth. In that grade, they did better than the rest of their peers at meeting and exceeding the standard by an additional 11 percentage points (44 percent statewide meeting or exceeding proficiency, versus 55 percent of Hispanic students). Low-income students did not perform well and didn’t meet the state average for proficient and above in any subject or grade. Their worst performance was in 11th grade math, where only 19 percent reached proficiency. Six other states in the 15-state testing consortium have released their preliminary scores, four of which published results that are comparable: California, Connecticut, Delaware and Washington. Among those, only California tested third through eighth grades and high school, as Vermont did. Vermont doesn’t like reporting test scores by “percent proficient” because it says it is not as accurate as using scale scores, but federal law requires releasing the information to the public in this way. The agency plans to release school-level SBAC results Sept. 19. 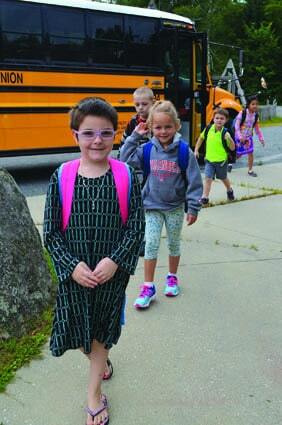 Killington Elementary School welcomed students back for their first day of school on Wednesday, Aug. 31. Some, like Angus Laramie (right), arrived with their parents; others via the big yellow school bus.